By the late '80s everyone had pretty much given up on Black Sabbath...and why not? Guitarist Tony Iommi was the only remaining original member and the band had seen an outrageous number of musicians and frontmen (six overall) slip through its ranks since Ozzy Osbourne's departure. So it was quite a shock when singer Tony Martin returned for a second go-round on 1989's pleasantly surprising Headless Cross. The album also benefited from the arrival of journeyman Cozy Powell — one of the few drummers who's sound is instantly recognizable. 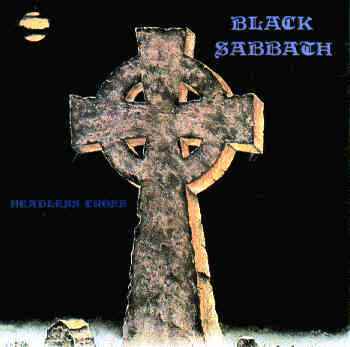 Arguably the finest non-Ozzy or Dio Black Sabbath album (along with 87's The Eternal Idol), Headless Cross is certainly the most consistent. Its songs place all emphasis on the almighty riff (from whence all rivers flow), with the drums, bass, keyboards, and voice playing only a supporting role. Morbid monsterpieces, such as the title track and "Kill in the Spirit World," possess massive power chords, but still manage to flow seamlessly into the more radio-friendly, yet still incredibly heavy material like "Devil and Daughter" and "Black Moon." For sheer malevolent power, "When Death Calls" is one of Iommi's most stunning compositions ever, while "Nightwing" flips the coin by introducing beautiful acoustic playing and, daringly said, highly poetic lyrics. For those who feel the need to stray from the Osbourne and Dio classics, there can be no better place to start. — Ed Rivadavia.